I've been a bit behind with posting my shopping goodies-- these ones are from December of last year! I'm currently away on an elective, and having tons of fun in the sun, and I'll post about it soon! Hopefully I'll be better with taking some outfit photos too. (: On a related note, since I'm away from home so often lately, the next post will be a special guest post! If any readers would like to write a guest post, I could definitely use another one too! 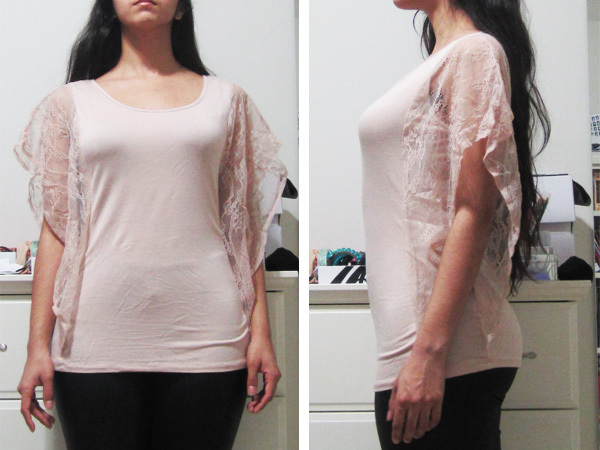 This top looked really weird on the hanger, as I find most drapey tops do. It really requires one to use their imagination or a fitting room. 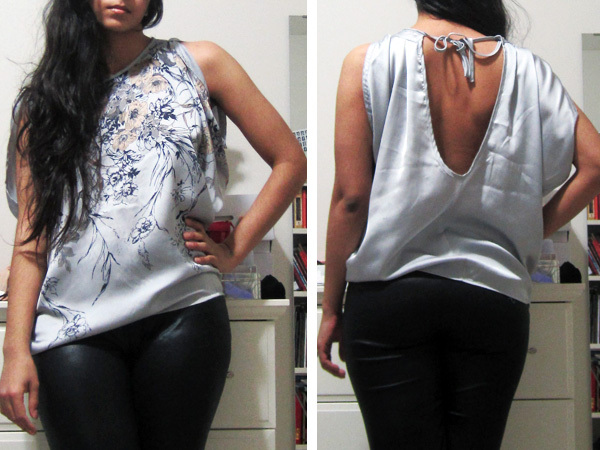 I like the open shoulders and back of this top, and thought it would be a fun addition to my wardrobe, seeing as I don't have anything like this, and tucked into a skirt or some pants with a cardigan or blazer, this blouse could absolutely be work-appropriate. I like how the print wraps around the top of the blouse too-- it's a cool design choice. I was so intrigued by this weird swingy piece of cloth when I saw it on the hanger. It was on super sale, and I could see why-- there's such a potential for old lady bathrobe territory with this thing. 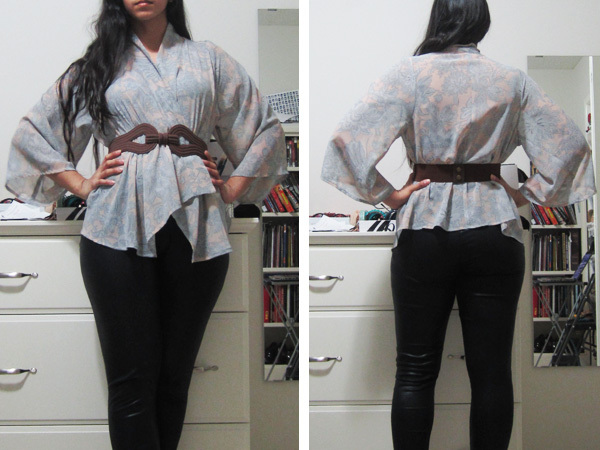 I really liked the print and the kimono jacket silhouette when I tried it on though, especially with a belt. I will say that it does tend towards a short bathrobe, as in the below pictures, but I promise that with proper styling a piece with this kind of structure can actually look quite edgy and fun. 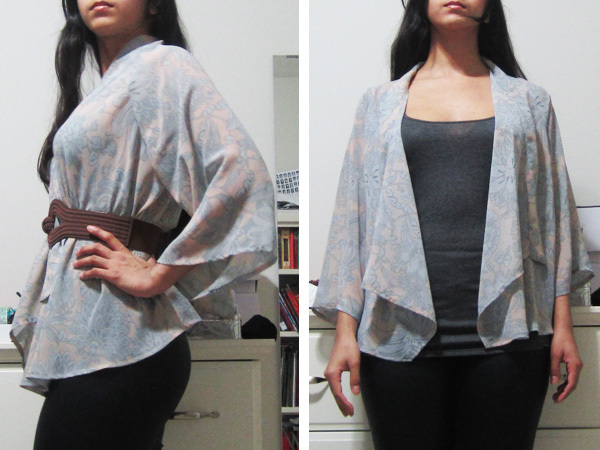 I've already worn this lace batwing sleeve top about four or five times since I got it. I like how effortless it is-- it's a super easy piece to wear, but it looks like I put thought into my outfit as opposed to just grabbing for things on the floor in the dark (it happens more often than I like). It works well tucked or untucked, which is really nice-- I think its the sort-of hybrid silhouette-- skimming the curves but with volume due to the sleeves. The pale rose/blush colour is very versatile and I would definitely call it a neutral, especially for spring. I have really been on an accessories kick lately. I just loved this cuff and thought it looked sort of art nouveau/art deco and picked it up immediately. I needed another cuff like I need another blazer (which is to say not at all), but I really like it. Due to all my shopping at Smart Set over the holidays, I accrued $10 in credit and used it on this necklace. I never really got into the feather trend, so here's my contribution. The colours make it very versatile and I think feathers in a girly colour help this piece range from lady-like to edgy. 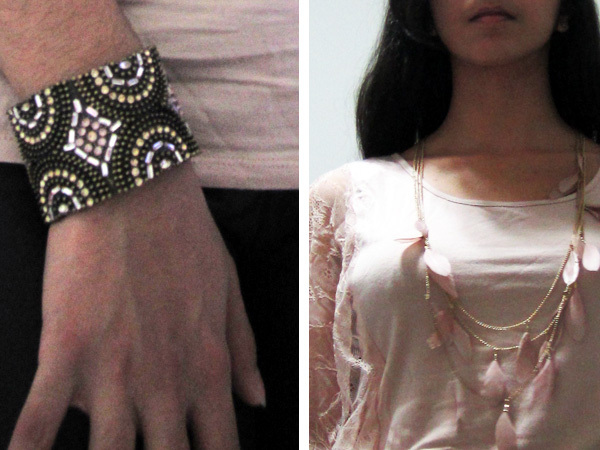 I love it when a necklace does double duty. In this post I love your leggings!